The Crow's Eye describes itself as psychological terror, where you find yourself investigating the disappearance of students and faculty 20 years ago from the (now) abandoned Crowswood Medical University. The terror is largely what went on, revealed through the notes and journals. While there is a level of creepiness created by the perennially dark environment (thanks goodness for the early-on never ending power of my zippo lighter), it is a reasonably mundane place right now. 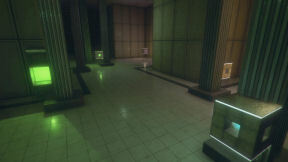 I did get bitten by two worm-like creatures, requiring a moment of frenetic shaking to get rid of, and the voice welcoming me to an experiment suggested that more was going on than just me poking about an empty facility, but by and large it was just dark and a tad foreboding. There is though some crawling through vents, a surefire way to feel unsettled. 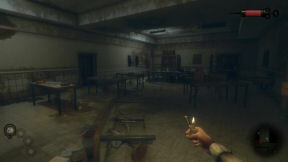 The Crow’s Eye plays in the first person and uses the mouse and keyboard. I suggest mapping the keys to suit yourself - I didn't much like the default ones. A health "syringe" top right of screen clearly indicates death can become you; so too the fact that you can collect material and then craft healing bandages in the inventory. There are no battles however, no creatures to flee, and harm comes from falling off things through mistimed jumps and the like. An amount of health will be depleted, but you will be restored to the fail point. If the syringe gets empty however, its game over. As well as bandages, I crafted other items, including lockpicks (thank goodness there weren’t many of the little lockpick games), maps (a very useful tool required to be made at each new level), and a powerful electro-magnet which came in very handy for shoving things about and even bouncing around. The adrenaline syringe you find, and which automatically refills after use, displays below your health syringe and is a very necessary part of getting through the environment – you speed up, things slow down, and great feats are possible. Much of the puzzling is environmental, invariably based around working out where to go next and sorting out how to get there. Unlock doors, restore power, flip switches, push and pull things about. Some is more complicated; position cubes strategically to make a jumping or climbing platform, once you flip the switch that sticks them to the walls. Speaking of which, there is a fair degree of jumping and ducking, not nearly enough to make it a platform game, but certainly more than enough for pure adventurers. There are also some straight out puzzles, one of which is repeated and involves pushing cubes around a room and which I rather enjoyed. There are two timed puzzles and a maze; make up your own mind about those. I did spend a lot of time exploring and walking and pondering, so while those other elements are present, for me they didn’t dominate. I thought it was a good balance of the things I like about adventuring, and those things I like about other sorts of games. It looked good too. 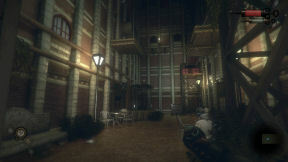 The gloomy environment was appropriately drab yet incredibly detailed. There was excellent ambient sound, with music used when needed rather than continuously, which I generally prefer. You can also smash things just cos, always a cathartic activity. You have completely free movement, including 360 degree panning, and looking up is always important. If you have an inventory item that is needed, usually a key or a battery, clicking where it is needed will just use the item. If you haven’t got it, you will get a message along the lines of “this door is locked”. You can’t save at will, only at save machines, but there are quite a few. I did backtrack though for that very purpose, and your crafted locational map will help you find them again. 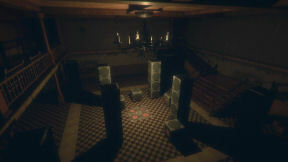 The game also autosaves when it accesses a new level. There are plenty of settings you can tweak through the menu, including choosing to play with items that matter highlighted. I had it turned on, and things of interest glow. It would have been a whole lot more playing hours with it off. I still needed to open things and look in things, but those items in plain view were easier to identify. Your very useful inventory items are accessible bottom left of screen, and bound to numbers 1 through 4 for quick access. Press tab to get the rest (and to craft). The map (when you have crafted it) is bottom right in close up, or push whatever key you have bound it to and it will display in full at the centre of screen. I did use it a lot for getting around, as it shows access points and other helpful things. The story is mad scientist gone even madder, and was probably the low point for me. I much preferred the exploration and activity to the tale. The end didn’t help, being a cutscene of much exposition delivered by said giggly maniacal mad scientist, but I really didn’t care. The sixteen or so hours that had gone before had been more than sufficient return for my attention.